Size: 24 x 24 x 36"
10.5 x 10.5 x 13.5" 15 x 15 x 23" 18 x 18 x 27.5" 24 x 24 x 36"
35 x 35 x 35" 47 x 47 x 47"
Impact's Extra Large Digital Light Shed is a high-quality, translucent cloth material housing for photographing small and medium products that can be lit with daylight, HMI, electronic flash, fluorescent quartz and tungsten light sources. Lighting is made simple and efficient and takes less time then conventional lighting solutions. Box Dimensions (LxWxH) 37.0 x 25.0 x 1.5"
Digital Light Shed - Extra Large - (24 x 24 x 36") is rated 4.5 out of 5 by 84. Rated 5 out of 5 by UPSman from This Light Shed is Awesome I use photography - as well as Photoshop - as a distraction from my chronic illness. I've always wanted to get a tent in order to just shoot items around the home and to expand my knowledge of different lighting and attempt some creative stuff as well. At first I was amazed as it came folded up like a sun visor for the front window of a car. When it popped open I knew I was going to like it immediatly. But first I had to attempt to put it back together - wind it back up to fit in it's case (another pleasant surprise was the case). I did so rather easily and since then it's been on my table ready to go and I fool with it any chance I get and my health allows. Rated 1 out of 5 by Stu from Not suitable for use The light shed itself is fine, but it comes with a set of fabric sweeps which are supposed to be used as seamless background, but instead come with deep folds that do not dissipate.? I've had one laid out for more than a week and the folds remain.? I called "customer service" at B&H and asked about how to remove the folds.? All I got was a big shrug.? "I dunno."? Ok, well can I iron this stuff?? "Dunno. May you can try to iron a small corner and see what it does."? The problem there is the sweep is not made of fabric, but a flocked nylon sheet.? I'm trying to iron it at low temps, wishing I'd never bought this thing.? So far no from it, just aggravation. Rated 5 out of 5 by JClark from Great photo tent I shoot jewelry and small scale metals of my own work and previously for a major museum and I'd used smaller versions of this tent before. The larger tent is so much better. The size makes it less noticeable in any reflections from the metal and still provides great diffusion. The larger openings allow for greater camera angles as well. It's is holding up well- the smaller ones have, too. This entire line tends to be pretty reliable, but as someone who's had experience with the smaller sizes, I'd recommend anyone go bigger than they think they need to when shooting small items. Rated 4 out of 5 by Bruce from Great for Consistent Multiple Production Shots I've been shooting professionally for 38 years and have found that this product does a very good job of helping move along production when you have similar multiple products. However, it does have it's limits and through my years of experience I know when to use it and when to utilize traditional studio lighting techniques. With that said, it still is a great help to professionals. It's knowing when you have to tweak the light shed and use some of your lighting skills (i.e., gobos, dots, scrims, lighting positions) along with it that you can really come to appreciate the time-saving attributes of the light shed. Rated 5 out of 5 by 9000 from Large, convenient I use this box mostly to shoot jewelry items. Some, like necklaces, may require significant room to show properly. 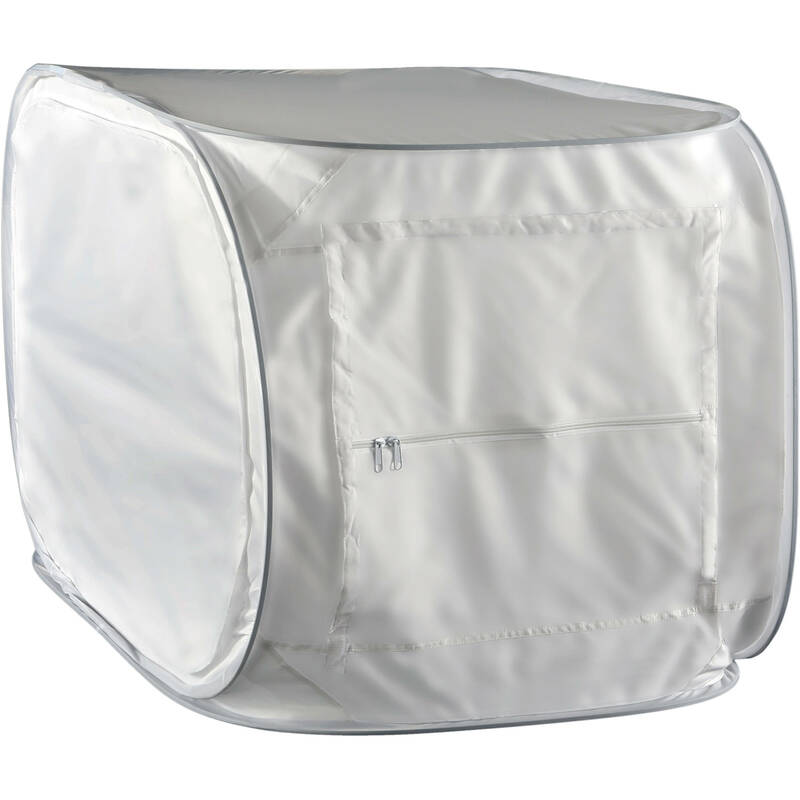 Two large openings allow to put and adjust items inside with relative comfort, and insert larger items easily. The light inside is quite uniform, without any visible effect from the wires. The large plastic sheets that come with the box allow to create a completely seamless white background. Worked great both with daylight from a window, and diffuse overhead electric lighting. The box is easy to unfold and easy to fold back, and, once folded, it stays folded. Does not feel flimsy. Obviously takes significant space to place, especially in horizontal mode. Rated 3 out of 5 by SWashi from Huge light shed with a design flaw This light shed is huge, and it does a pretty good job. It has two removable panels, one on the short side and one on a long side (it's a rectangle). I take photographs of objects that guests bring to an event series, which means that I don't know the size of the items I'll be photographing until picture time, so I figured the largest light shed would be a good choice. The zipper is on the removable panel for the the short side (as shown in the product photo), BUT on the long removable panel, the zipper is actually on the non-removable panel--meaning that if you shoot through an open window, as I do, the zipper appears in the background of your shot. This design flaw makes it much harder to reposition objects within the tent if you use the small square as the base for photographing narrow, tall objects. I would absolutely love this if both zippers were on the removable panels, but unfortunately they are not. I still might keep this, since i can't find another one without this major design flaw. Rated 5 out of 5 by Bob W. from Well pleased I would call myself an advanced amateur photographer. I enjoy macro and other close up photography and had tried to make my own light box. It worked ok, but I wanted something better. This product is well worth the money. It is easy to set up and take down. I read a review that it was difficult to fold up, but I have not found that to be the case and I am a bit of a fumble fingers. Takes 5 seconds to take it down. I love the variety of openings which allows you to photograph from different angles. The drapes easily velcro in place. They do collect a bit of dust, so you need to be aware of that. But also, I got some flower pollen stain on the white one. I sprayed it with Spray n Wash, wiped it with a clean cloth and it was gone. Easy. Would definitely recommend this product. Rated 5 out of 5 by NHXP from Great Idea There a few things I like about this tent Once you have discovered the secrect of setting it up it is a snap. (Pun intended) For those like me who do not have a permanent place for setups it becomes easily stored. Has a variety of openings for both, light and object placement. Good value. Only minus could be overcome with a one page series of pictures or drawings as to where the secrect pull point is. Kind of like how to get the escape door or window open on an airplane. Are other colored sweeps with the touch tabs available? Particularly dark blue. There are a few other brands of backgrounds that work with Velcro like the Impact models.This one uses clips but you should be able to attach MyStudio Color backgrounds.The next one is a bit larger but you should be able to attach it in the shooting tent. That is the Smith-Victor 28.